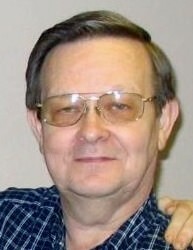 Jan Charles Hansen, age 77 of Perrysburg, Ohio passed away peacefully at home after a long illness. He was born on March 2, 1941 in Toledo, OH to Kermit and Pearl (Lerman) Hansen. Jan was a graduate of Whitmer High School. He retired from Dillin Automated Systems Corp. where he worked as a machinist after many years. Jan enjoyed photography, was an artist and most of all cherished time with his family, especially his grandchildren. Surviving are his children, Dawn (Chad) White and Jason (Andrea) Hansen; grandchildren, Tony (Katie) Worthington, Nicholas Worthington, Sarah (Dylan) Roberts, Allison, Steven, Caleb and Evan Hansen; great grandchildren, Skylar, Liam, Landon and Faith; brothers, Ronald (Mary) Hansen, Roland (Judith) Hansen, Garry (Lorraine) Hansen and Daryl Hansen; sister, Cheryl (Charles) Desgrange. Also surviving are many nieces and nephews. Jan was preceded in death by his parents; wife, Suzanne in 2012; and his brother, Richard (Gloria) Hansen, USMC. Family and friends may visit at the Sujkowski Funeral Home of Rossford, 830 Lime City Rd. on Tuesday, October 9, 2018 from 2 to 8 PM. Funeral services will take place on Wednesday, October 10, 2018 at 11 AM in the funeral home. Interment will follow at Ft. Meigs Cemetery in Perrysburg. The family would like to extend a special thanks to Heartland Hospice for the special care given to Jan.